Our earth is 4.54 billion years and during all these years numerous life forms have flourished in it. Dinosaurs were land-living reptiles which inhabited the planet millions of years ago. They are a group of extinct reptiles that lived between the Triassic (about 237 million years ago) and the end of the Cretaceous (66 million years ago). As the dinosaurs became extinct 65 million years ago, we can now see their skeletons in museums. When was the term dinosaur coined? The term dinosaur was originally coined in 1842 by Richard Owen (1804–1892), a specialist in comparative anatomy, in 1842. Etymologically, the word means “terrible lizard”. The knowledge we have of dinosaurs is derived from the fossils that have been found on every continent. Over the years and with the help of technology scientists have created realistic simulations of these amazing creatures. As a result of these simulations, we can get an idea of how these huge animals look, what their habits were and how they lived. What types of dinosaur existed? There were different types of dinosaurs. While some of them were ferocious murderers, some were gentle herbivores. They were of different sizes. Some were of giant sizes. Ultrasaurus (or Ultrasauros), the largest of them, had the potential of reaching 15 meters high when it stretched its head up. Micropachycephalosaurus (or Micropachycephalosauros), the smallest dinosaur, was about the size of a rabbit. According, to the research by scientists, there were more than 700 different types of dinosaur that inhabited the Earth for over 150 million years. However, they are generally classified into two major groups: carnivores (meat-eaters) and herbivores (plant-eaters). While Tyrannosaurus Rex was carnivore, Triceratops came into the category of herbivore. The former had the potential of swallowing a whole person. What were the features of the dinosaurs? Dinosaurs have different characteristic features. Carnivores had sharp teeth and claws which stood them in good stead while going for hunting. The feature that provides the greatest distinction between dinosaurs was the structure of their hips. Accordingly, dinosaurs can be classified into two groups: saurischians and Ornitrisquios. To the group saurischians belonged to giant herbivorous dinosaurs like Brachiosaurus, Apatosaurus and Diplodocus, the largest terrestrial vertebrates of all time and bipedal carnivores like Tyrannosaurus Rex and Velociraptor. Saurischians appeared in about 228 million years ago in the Triassic and diversified during the Jurassic and Cretaceous periods. Why did Dinosaur become extinct? The cause of the mass disappearance of the dinosaurs is a mystery which is still in the realm of debate. Dinosaur inhabited the Earth for over 150 million years, and then mysteriously became extinct. What are the Myths about Dinosaurs? There are many misconceptions we have about dinosaurs. One of them is that man lived with dinosaurs. It is not true. The dinosaurs became extinct long before the first human appeared on Earth. While dinosaurs became extinct 65 million years ago, humans appeared on Earth 6 million years ago. Another myth is that all dinosaurs were of huge sizes. In fact, they were of all sizes. While dreadnoughtus schrani discovered in Patagonia in Argentina weighed 59 tons and were 26 meters long, the Compsognathus dinosaurs were small, weighing about just 3 kilograms. Question 1: What are the closest living relatives to Dinosaurs on earth today? Answer 1: Would you believe that birds are the closest living relatives to Dinosaur today. Question 2: What is the oldest known Dinosaur? Answer 2: The oldest Dinosaur known to us is the Eoraptor. `The Eoraptor was an omnivore (meat eater) and roamed our planet around 230 million years ago. Question 3: What does the word Dinosaur mean? Answer 3: Like so many words Dinosaur derives from the Greek words Deinos (terrible) and Sauros (Lizard). So the translation is Terrible Lizard. Question 4: What was the largest Dinosaur that we know of? Answer 4: The largest Dinosaur that we know of was the Argentinosaurus Huinculensis. A monster that could reach 130 in length. Imagine that coming towards you….no thanks. Question 5: Are Crocodiles and Alligators Dinosaurs? Answer 5: These reptiles have been around for millions of years or at least the Crocodylia body has and for that reason yes the Crocodiles and Alligators that we see today are living Dinosaurs. How cool is that? we still have living dinosaurs. Question 6: Who studies Dinosaurs? Answer 6: Paleontologists study Dinosaur fossils. Question 7: What did birds evolve from? Answer 7: Birds evolved from Dinosaurs, a group called Theropods. Question 8: Did people live the same time as Dinosaurs? Answer 8: No Dinosaurs had died away before humans came along. The gap between the two was around 65 million years. Declan, Tobin. " Fun Dinosaur Facts for Kids ." Easy Science for Kids, Apr 2019. Web. 23 Apr 2019. 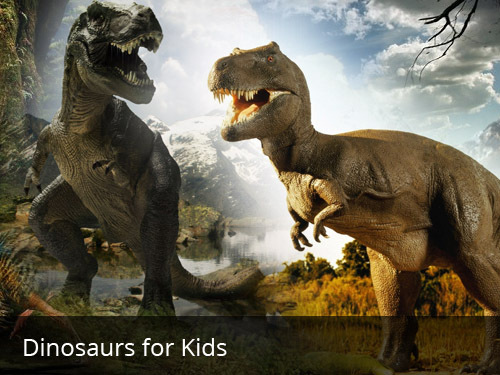 < https://easyscienceforkids.com/dinosaur-for-kids/ >.